Malaysiakini is a so called ‘independent’ online portal, which is an illustration of so many Malaysians’ aspiration of a ‘Freedom of Press’. However, the pro-Opposition portal which business model include ‘international funding’ of ‘NGOs which are promoting democracy, freedom of press and freedom of speech’ is doing exactly what is expected of them; using the-Opposition brand of ‘journalism’ to manipulate and lie (whenever possible). Women, Family and Community Development Minister Shahrizat Abdul Jalil said today that her family does not deserve the attacks over the National Feedlot Corporation (NFC) project, which they own and manage. “I don’t think they deserve it (the accusations), because they work very hard,” she said when asked whether her family deserved the multi-million project. After almost two weeks of silence on the controversy, she also commended the ministers who had answered questions and tackled criticisms over the cattle rearing project. “The agriculture and agro-industries minister has responded, and I have been informed. The answers are quite clear… I am happy because the ministry will monitor the project,” she said after officiating an arts exhibition in Kuala Lumpur this afternoon. Hitting back at her detractors who questioned the propriety of her family members being awarded the project, and criticisms centering on its currently troubled state of affairs, Shahrizat said her family does not deserve is all the brickbats that have been thrown at them. “I think my family does not deserve to get these things (being) said by the opposition,” she added. Shahrizat also accused the opposition of seeking to use the controversy against the women’s wings of Umno and BN. “To me, I see this as part of a political agenda. This is an attempt by the opposition to weaken the spirit and actions of Umno Wanita. “We are not so easily broken,” she asserted. “I have been in politics for a long time. They (the opposition) are not really interested in the NFC (itself). “It is directed to me, as Umno Wanita chief, and as BN Wanita chairperson,” she added. Shahrizat trained her sights particularly on her counterpart in Pakatan Rakyat, PKR Wanita chief Zuraida Kamaruddin, for implicating her family in the project. “Their political agenda is very clear. They are shaky, just like that PKR Wanita chief. I’m ashamed that a Malaysian woman can be like that,” she sneered. Correction: We have earlier reported Shahrizat said her family “deserved” the NRC project. It should be “her family doesn’t deserved the opposition attack”. We regret the error. That was originally posted on 1731hrs. Malaysiakini reported that Shahrizat claimed that “her family deserved the NRC project”. When the story came out in Malaysiakini’s public domain, Shahrizat was very unhappy. Then she tweeted Steven Gan that the report was a complete lie. Malaysiakini rectified the story four hours later to what it is now. 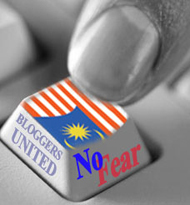 Malaysiakini claimed in a footnote qualifier the earlier reporting was “an error”. Then again, it is believed it was never an error in the first place. It is never a surprise when Malaysiakini does that. Where I am at the moment, that lie was intentional. Malaysiakini tends to manipulate whenever and where ever they can. I had the similar experience once, with the same reporter Salhan K Ahmad. When the nation was shocked with what I posted and Utusan Malaysia carried the story on the front page on 7 May, Malaysiakini was one of the most responsive media especially when Jelutong DAP MP Jeff Ooi demanded that I apologize to the Christians and eventually made a Police report against the posting. What Malaysiakini posted as a quote from me wasn’t exactly what I said when Salhan called me. The consistency of Malaysiakini to manipulate if now lie, meets the KPI that has been set for the pro-Opposition portal. They have to work extra hard now, to cast a doubt against the Federal Government especially amongst the internet savvy professionals and urbanites. More over, when portals like Malaysia Today lost its credibility and even the editor Raja Petra Kamaruddin is on the run and The Malaysian Insider too lost its credibility with the Tajudin Ramli’s case.